The inscription listings have been newly updated for all headstones within Section A. This update includes graves which were previously missed when the previous listing was made, and also any inscriptions that have been added to new or existing headstones since then. 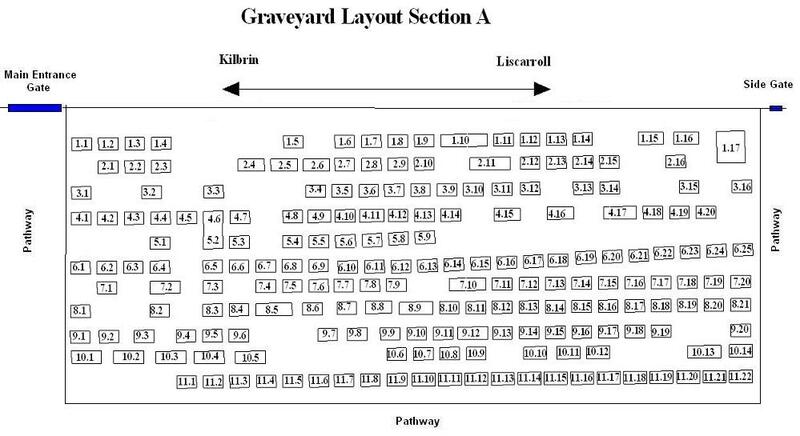 A detailed map of all headstones within section A is provided below to allow visitors to easily locate a grave of interest. Many thanks to Sheila O'Reilly (Garranmacgarrett) for the vast amount of work involved in updating the listings for this section. Erected by Thomas Heffernan and family Ballybahallow. who Died 10th Feb 1924 aged 55yrs. In Memory of John Falvey, Ballyrushon. Who Died February 11, 1911. Died Feb 16th 1906. Aged 8 yrs. Cornelius Coleman Died Nov 11, 1963. Owen Sullivan, Ballinla, Died February 26, 1909. Died 23rd April 1913 Aged 69 yrs. Their daughter Margaret Died Jan 8th 1936. Michael O’Mahony Died Jan 10th 1962.
Who Died September 29, 1913, Aged 66yrs. His mother Nora, Died April 1920. His brother Jeremiah, Died 1918. Died May 10th 1944 Aged 77yrs. who Died 22nd July 1917. Nora Died Feb 18th, 1950. The Burial Place of the O’Flynn Family Ardprior. Died 18th May 1901 Age 64 yrs. Their Children: Ellen Died 27th May 1901 Aged 28 yrs. Bridget Walshe Died Dec. 29, 1945. In Loving Memory of Julia Buckley (nee Finn) Kilbrin. Died Aug. 16, 2009 Aged 95 yrs. William Kelleher Curragh Died July 7, 1945. Father Joseph. Died 31st 1928. Erected by Mrs Nora Fitzpatrick Knocknanuss. Erected By: Simon Dennehy, Coolmahane, Kilbrin. His Father Timothy, Died Aug 20th 1930, Aged 83 yrs. Mary Dennehy, Dromineen, Died Dec 30th 1936. Her Husband Patrick Died April 29th 1947. In Loving Memory of Teresa Walsh, Freemount. Who Died July 6, 1950 aged 31 yrs. In Loving Memory of John Nunan,O’Brien St, Kanturk. Who Died 23rd March 1931. Julia Nunan Died Mar 5th 1931. Sheila Nunan Died 23rd April 1932. Maria Nunan Died 1st Oct 1962. Daniel Lucey, Died June 27, 1926, Age 69. Jane Lucey, Died June 29, 1937. Their sons: Cornelius, Died October 25, 1952. Michael Died August 2, 1962, Age 70. His Wife Julia Died Aug. 5, 2007 Aged 92 yrs. Mary (Ciss) wife of John P.
Mary daughter of John P.
Died January 25 1937 Age 52. Died May 16, 1938 Age 94. Mary Ann Sheehan Died Jan 10, 1951. Died 6th Oct 1977 83 yrs. Died 13th May 1969 57 yrs. Died Aug. 12, 1996 Aged 85 yrs. Died 4th Dec 1934 Aged 80 yrs. Died Oct 20th 1934 74 yrs. Died 2 August 1932 Age 62 yrs. His wife Mary Died 10 Nov. 1952, Age 78. Died June 3rd 1931 Aged 50yrs. His daughter in law Mary. Died Nov 26th 1981 Aged 72yrs. Died 10th April 1984 Aged 71 yrs. (His son Patrick Lynch died 20th June 1956 84yrs. Who Died 31st Dec 1912 27 yrs. In memory of his Father Stephen. Who Died Feb 15th 1915 Age 77yrs. Died March 8th 1916 Age 5yrs. His brother Stephen Died Feb 23rd 1925. Died April 1st 1933 Aged 72 yrs. His wife Hanora died 2nd April 1936 Aged 73yrs. Erected to the memory of John Mackessy Roskeen, Lombardstown. Who died Nov 20th 1940 Aged 69yrs. His brother James of Knocknanuss died Feb 1 1952. His wife Ellen died 2nd March 1963. Died 13th 1937 Age 63yrs. His wife Catherine Died Nov 29th 1965 Age 83yrs. Eillen died 1975 Age 70yrs. Died 7 June 1943 Aged 80 yrs. Mrs Kate Murphy Died Jan 20 1955 Age 93. In Loving Memory of Bridget Murphy, Freemount. Who Died 12th Feb 19, 1945 Age 64 yrs. Their daughter Mary (Mae) O’Donoghue, Castlemagner. Died Dec 30th 1983 Aged 79yrs. Their Son Tommy Died 4 Aug 1991 Aged 81 yrs. Died April 10, 1964 Age 15yrs. Mother Ellen Died April19, 1915 Aged77yrs. Son James died Nov. 6, 1898 Aged 4yrs. In Loving Memory of Cornelius Murphy N.T. His son Tadhg Murphy N.T. Also their grand child Mary Moylan. Who Died Dec. 12, 1900 Age 25yrs. Julia Dennehy Died 23 Jan 1911. His Wife Nora 28th Nov 1949.
Who Died Sept 12 1950 Aged 63. Curraghs who died May 9th 1945. His wife Mary died 20th May 1945. His wife Catherine Lynch Died 5 Oct 1956. In loving memory of Jeremiah O’Hea. His wife Margaret died 12th Feb 1962. His Wife Mary died April 2, 1980 Aged 81. Eugene O’ Keeffe Clonrobin House. Died Jan. 12, 1954. Age 41 yrs. William O’ Sullivan Knocknacolon, Kanturk. Also John & Nora Driscoll. His Wife Mary Died Mar. 12, 1972. Margaret O’ Shea, Springvale, Kanturk. Her Sister Margaret Who Died Oct. 18 1975. Mrs Catherine O’ Leary Kilbrin. Died October 19 1965. Age 10 yrs. His mother Mrs Hanora Corkery. Who Died May 27, 1958 Aged 84 yrs. Mary (Moll) O’ Sullivan Marybrook. Her father Timothy O’ Mullane. Who Died Dec. 9, 1964 Age 33 yrs. John O’ Sullivan Dromineen, Kilbrin. Cornelius O’ Sullivan, Corbally, Kanturk. Br. Casimir (Dan) Hannon F.S.C. Died in Brighton, England, Jan 19, 1970. Cornelius O’ Connell & Family. Erected by Bessie Linehan, Kilbrin, in memory of her husband Patrick. Died Sept. 14 1943 Age 70 yrs. Died Jan 5, 1986 Age 67 yrs. Died Oct. 1, 1999 aged 86 yrs.